Data communications and networking are changing the way we do business and the way we live. Business decisions have to be made ever more quickly, and the decision makers require immediate access to accurate information. Why wait a week for that report from Germany to arrive by mail when it could appear almost instantaneously through computer networks? Businesses today rely on computer networks and internetworks. But before we ask how quickly we can get hooked up, we need to know how networks operate, what types of technologies are available, and which design best fills which set of needs. Research in data communications and networking has resulted in new technologies. 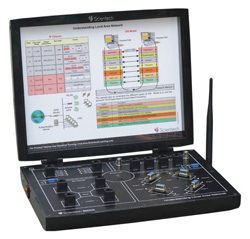 Scientech offers powerful data communication and networking laboratory solutions. It is designed to be user friendly and it supports self learning through flexibility of making the connections by the user itself. In depth knowledge and its functional details can be studied by step by step approach. Overall it’s a complete package where students can perform practical’s from fundamentals to advanced level of data communication and networking.